Product prices and availability are accurate as of 2019-04-12 20:56:00 EDT and are subject to change. Any price and availability information displayed on http://www.amazon.com/ at the time of purchase will apply to the purchase of this product. The Silver Fir tree can reach heights up to 150 feet. The Silver Fir Tree is native to the mountains of Europe. The Silver Fir often forms woods with other Fir and Beech trees. 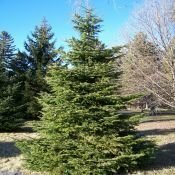 The Silver Fir was the first species used for Christmas trees but it has been replaced by more popular varieties such as Balsam Fir and Norway Spruce. Soil Type: The Silver Fir tree is the most demanding conifer in the woods. It requires deep, quality soil, moist subsoil and a mild climate with plenty of shade. Stratification Requirement: 30 days cold moist stratification.